Well I guess it is long past the time we joined the YouTube generation, and yes, we are now on YouTube!! The more you and your friends watch, the higher rankings we get which is good for potential future donors!! 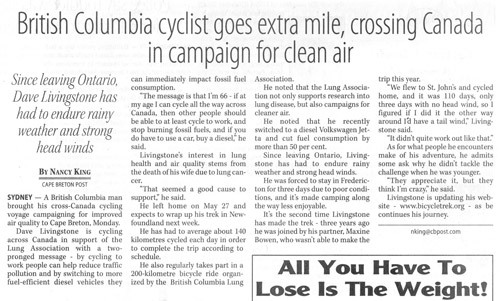 Cycle Across Canada? Not for a while! Yes – Dave needed a couple of hours surgery to fix the problem!! 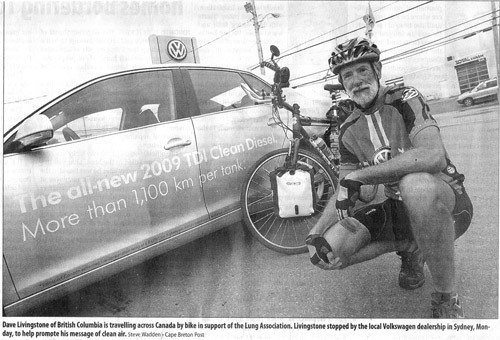 For most of Atlantic Canada, this was the view seen by passing motorists – my home-made Volkswagon advert!! Nice jacket, but unfortunately so much rain, it lost all its waterproof characteristics before Newfoundland, and I had to buy another! Just to backtrack, here is my last photo before heading inland away from the St Lawrence Seaway which turned out to be my last fine day for quite a while!! A nice day along the St Lawrence – Riviere du Loup in the distance!